In this yoga teacher training program there will be plenty of exciting experiences and hard work awaiting. You will develop spiritually, physically as well as psychologically. Yoga is a very broad and life-long study, and here we will provide a secure base for those who want to go deeper into themselves through yoga. 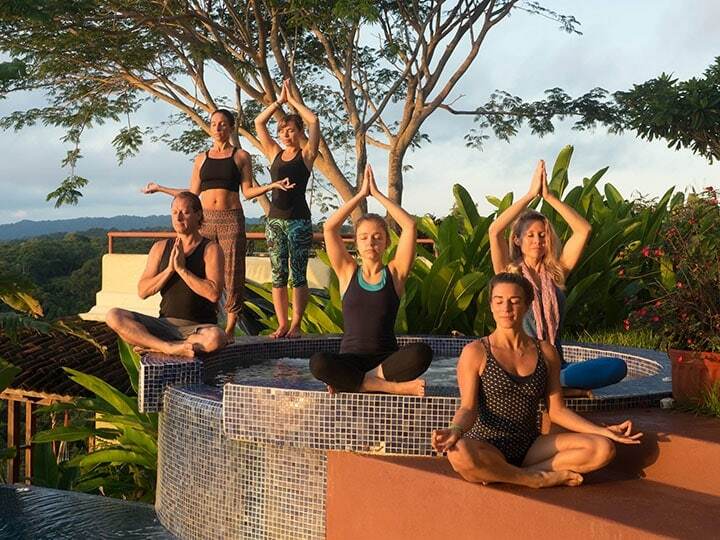 In this 200-hour yoga teacher training we will cover all the important elements from yoga positions to the anatomy of movement, pranayama to philosophy and more. Below we describe some of the topics the program will cover. In addition to the scheduled hours of teaching with Peter, all students are expected to read some obligatory texts (about 300 pages including philosophy, manual, anatomy, etc.) Also, students will be asked to do some homework to pass and eventually a final exam paper and a project / karma yoga. This Yoga Teacher Training will include a total of 160 contact hours with Peter: 8 1/2 hours per day plus 7 evenings of 2 hours and 3 days off. Also included is a one year subscription to Peter’s online studying platform, Yogidia.com to study Classes and Asanas prior to arrival. 10 hours of class/asana practice and study should be spend on sequences given from the teacher upon signing up to Yogidia.com. Students must furthermore have a minimum of 10 hours of yoga practice before arriving. Contact us for details about how to prove these hours. Students will be asked to teach (gain experience) and/or study 20 hours (to gain insight and self chosen subject) after end of training to receive their certification. These personalized assignments will be discussed with Peter before being given to the student. How to teach a Vinyasa Yoga class with precise adjustments and intelligent sequences. Learning about injuries and how to work with yoga therapeutically. Give an Thai Yoga Massage as well as using these techniques in Yoga classes. Understanding of Anatomy, and Physiology of Yoga and its movements. Use and instruction in breathing techniques. Meditation and teaching simple techniques. Studying and discussing the Yoga Sutras, Eight Limbs of Patanjali and other spiritual texts. Peter Kaaberbøl Kristensen is the founder of LagoCph school of yoga in the city of Copenhagen, Denmark. He’s also an accomplished personal trainer, and the creator of the “X-Pand Me” body stretching system. In addition to yoga, he’s a master practitioner of martial arts, meditation, and bodywork and for the last fifteen years has devoted his life to training yoga teachers worldwide. Peter has a knack for explaining complex yogic principles in a way that helps his trainees investigate their body’s subtle energies. By bringing his students’ awareness to their inner worlds, he helps them deepen their yogic practice from the inside out. His intensive teacher training programs deepen the trainees’ personal practice and guide their teaching techniques to a place where they can freely impart the body’s inner wisdom to their own students. Peter began practicing yoga at 18-years old and has studied with a broad range of classical Indian teachers including Akhil Bhattacharya and massage master Rahul Bharti in Nepal. He has practiced extensively in India, Brazil, Costa Rica, Guatemala, Japan, and the United States. His interest in bodywork and movement took him to martial arts, including Aikido and Capoeira, Thai yoga therapy, and Acro yoga. Peter runs his teacher training programs in Denmark and, in tandem with Paula Tursi, in Costa Rica, Guatemala, and Honduras. He lives in Copenhagen with his wife and two daughters. Yoga is considered a divine science of life that came to enlightened wise men through meditation in India more than 2000 years ago. Yoga is first mentioned in two old Indian collections: Vedas and Upanishads (the later part of the Vedas) and the latter was the platform for yoga teachings and philosophy called Vedanta. We want the program to create an overview of yogic development and teachers should become acquainted with Yoga’s Eight Limbs, which are a set of ethical rules of conduct considered to be an important part of yoga practice. Asanas are defined as positions and the word directly above phrase is the seat. Basically postures were designed to act as stable positions for extended meditation. But more than that, the Asanas open energy channels (chakras) and the physical centers of the body. Asanas purify and strengthen the body and control and focus the mind. Asanas are a classic part of yoga’s eight limbs, which stipulates that asanas should be stable and comfortable, casual and permanent. The word Pranayama comes from Sanskrit and is usually translated as “breathing technique.” Pranayama originates from the yogic science, which is about checking the “flow” of Prana (life energy.) In yoga it’s said that when you control this pranic flow, you control the physical and mental flow of energy in the universe, and on a daily/practical level this controls your bodily systems including breath, body, organs and the mind. In Vinyasa yoga, we practice Ujjayi breath, which is an invigorating and soothing tool. Breathing creates heat in the body which have a direct impact on the performance of the different asanas, etc. It’s not the only breathing we use but most often it is called base breath for other Pranayama exercises. Bandha means keeping or strengthening: bandhas create stihra (stability / support) and allows for freedom of movement. They collect the body’s internal wind / energy and therefore provides a better and stronger flow of energy and body and thereby mind. Koshas – you can call the various levels as we have in the body, the physical, intelligence, energy body, etc. These levels are important to be aware of through learning, export and training. Through anatomy we ensure a comprehensive understanding of our students and the body and its movements we often work with themes or understanding of individual areas. At each training class follows an anatomical examination. This means that we create insight into positions versus physics / anatomy in motion and this both through theory and practice. The purpose of alignment or adjustment / correction for optimal posture is to get in touch with your inner body. When we have taught for a while we begin to get a better overview of the class and will be aware that not all students have the correct alignment (optimal posture). In this part of the course we focus on the most appropriate ways to move students into their optimum positions. In this part of the course you will learn first of all the basic elements of massage technique. We review and work with techniques that will enable you to perform a 1½ hour full body massage, which included included muscle massage, yoga features, acupressure, joint manipulation, relaxation exercises and work with energy pathways. In other words, you will be given tools to work with the body, both as a complete 90 minutes of body massage and also with specific problems. As we are becoming yoga teachers we will bring to attention how to use these techniques when teaching yoga classes both for the corrections of students or as therapeutic tools in one-to-one sessions. The program includes homework that must be done between training modules. There are typically somewhere between 2-6 hours per week. Please get these exact books. E-books will do too. Fill Out This Reservation Inquire Form To Secure Your Spot Today!